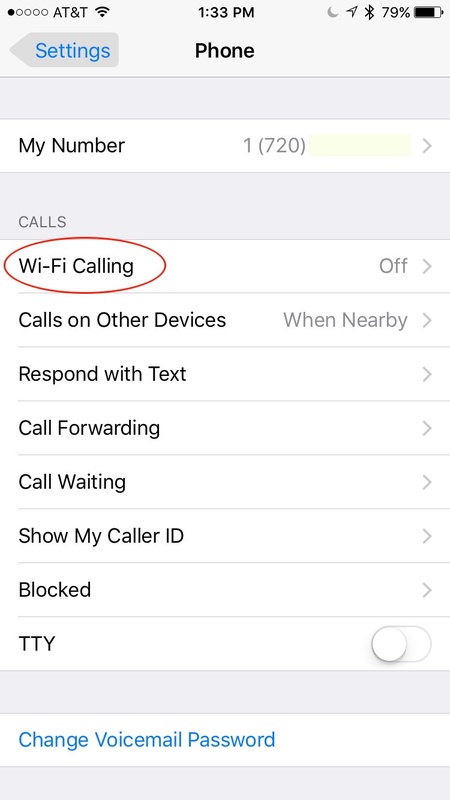 iOS 8 Introduced Wi-Fi Calling and iOS 9 introduced what's called Wi-Fi Assist. They're two distinctly different features. The first has no downside, but the second could, and it's turned on by default in iOS 9. Let's look at the difference. This is a feature that allows the iPhone user to use a Wi-Fi network instead of a cellular network to make a voice phone call. Think of it as what's called VOIP. Various carriers have rolled out this service over time for the iPhone. The first were T-Mobile and Sprint earlier this year. iOS 9 adds support for AT&T. I haven't heard anything about Verizon support for Wi-Fi calling. Even though the iOS capability may be there, it's up to the carriers to activate the service regionally. For example, the carrier I'm familiar with is AT&T, and that carrier has rolled it out in certain test areas of New York, New Hampshire and Illinois. There may be others. Apple has a support page that explains how to activate it. You'l use Settings > Phone > Wi-Fi Calling. If it's successfully activated, you'll need to enter your address for emergency 911 service, something that's already a part of AT&T's microcell service. Speaking of microcells, the nice thing about Wi-Fi calling is that those in poor cellular coverage area using microcells will finally be able to dispense with those units that are often awkward to configure on a home network and keep running. 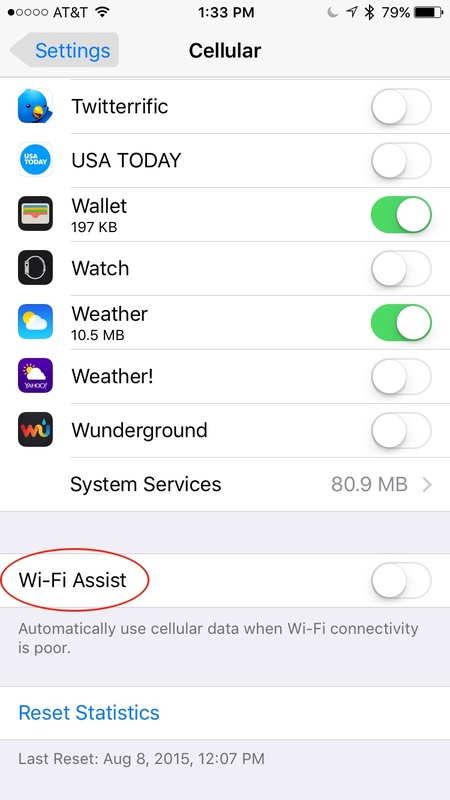 Wi-Fi Assist was introduced with iOS 9 and turned on by default. Here's the background. Historically, your iPhone would try to connect, first, for data on a Wi-Fi network. Wi-Fi networks are fast and free, so that's good. If, however, an app cannot connect on Wi-Fi (no signal), it wil try to connect over the cellular network, subject to the rules you set up in Settings > Cellular > Cellular Data Usage. That's where you specify if an app has permission to operate over a cellular network. For example, you'd always want your maps app (Google, Apple, etc) to operate on the local cellular network so you can navigate outdoors, away from Wi-Fi networks. With Wi-Fi Assist, your iPhone will detect a degrading Wi-Fi signal before it drops completely and switch you over to a stronger cellular signal. The idea is to eliminate annoying network discontinuities. As the iOS 9 caption in Settings explains it, "Automatically use cellular data when Wi-Fi connectivity is poor." [Emphasis mine.] What that means is that if you have an area in your home or office with a poor Wi-Fi signal, the iPhone could seamlessly switch to cellular without notifying you. That could result in a more active use of cellular data than you've been accustomed to in what you perceive as a primarily Wi-Fi environment. For those who elect to pay for a rather limited data plan, this change could result in unexpectedly large data usage. Over at TekRevue, Jim Tanous explores another case that may apply to some in an enterprise setting. Go to Settings > Cellular and scroll all the way to the bottom. This setting is easy to overlook because it's at the end of a potentially very long list of apps. In my experience, settings like that, that can be pushed down out of sight, should always be fixed at the top of a page. Wi-Fi Calling looks to be a major boon to customers because Wi-Fi is just about pervasive indoors while cell towers can't be everywhere, are an eyesore, and sometimes highly regulated by local municipalities. Also, for those who must use them, getting rid of microcells will simplify home networks. Time will tell if Wi-Fi Assist turns out to be a novelty that catches some users by surprise or whether it becomes a working norm for most users. If in doubt, turn it off and test it over time with awareness of how it works.